Talulah Gosh was a guitar-pop group from Oxford, England. 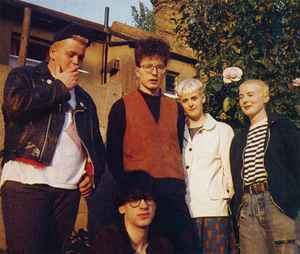 Playing together between 1986 an 1988 they were one of the leading bands of the twee pop movement, taking their name from the headline of an NME interview with Clare Grogan. The band originally consisted of Amelia Fletcher (Guitar, Vocals), Elizabeth Price (Guitar, Vocals), Mathew Fletcher (Drums), Peter Momtchiloff (Guitar) and Rob Pursey (Bass). Bassist Rob Pursey left the band in 1986 and was replaced by Chris Scott (4). Elizabeth Price left in 1987 and was replaced by Eithne Farry. Talulah Gosh disband in 1988 and the Fletchers, Momtchiloff and Pursey formed the seminal twee pop act Heavenly in 1989.